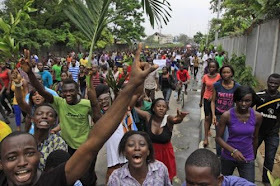 The Abia Head of State of the National Association of Students of Nigeria (NANS) went on Monday through the streets of Umuahia in protest against the current national strike of the National Union of Academic Staff (ASUU). The protesters, who wore banners with different inscriptions, called on the federal government to negotiate with the outstanding teachers to put an end to the action as soon as possible. Some of the posters say "The government does not market education", "Save education, save the future" "The budget allocation of seven percent is a priority that is misplaced", among others. The NANS representative in the southeast, Cokey Nwachukwu, said that the students were tired of staying at home and wanted to go to school. "Some of us should take four or five years of courses, but as it is now, the years are likely to spread due to the strike. "Most of us who are supposed to have been mobilized for the National Youth Services Corps are now at home. "Very soon they will tell us that they will go to the general election and change our academic calendar," he said. The students also urged the federal government to tackle the security challenges in the country, particularly in the Northeast, as a matter of urgency.